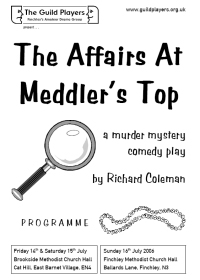 Sir Hector Croquet's country house, "Meddler's Top"
Welcome to the Guild Players summer production. This year we are making a change from our regular one night 'anthology' summer show. We are pleased to present a fully staged play for two nights at a different location, plus an extra performance back at our 'home' venue. From September 2006, Brookside Methodist Church in East Barnet and Finchley Methodist Church in Ballards Lane will have closer links. All the Methodist Churches in the borough are coming together to form a new 'Barnet Circuit'. We hope that this light comedy will be an entertaining introduction to the Guild Players if you haven't been to one of our productions in Finchley before.